Growing up in a military family, Asgton Stephenson was never prone to sitting still. Just a year after she was born in New Mexico, Asgton’s entire family relocated to Guam. It was on this small island territory in the Pacific that she got her first taste of volunteer work: besides an accomplished career in the U.S. Air Force, Asgton’s father was also the lead instructor for the Special Olympics in Guam. From a young age, Asgton would assist her father with the games. This experience fostered a lifelong connection in her heart to the special needs community. And though her family would continue to move around the country, Agston’s passion to give back to each community remained the same: by the time she graduated from high school in Ankeny, Iowa, she had served 1,935 verified volunteer hours. Because of that commitment to a lifestyle of community service—particularly to the disabled community—Scholarship America is proud to announce that Asgton Stephenson is the 2016 Dollars for Scholars Student Volunteer of the Year. Once her family settled in Iowa, her home of nine years, it was no surprise when Asgton became heavily involved in service to the Ankeny community. During the spring and fall, Asgton could be found at Ankeny’s Miracle League mini baseball park, setting up bases and helping kids with disabilities feel like major leaguers. In high school, she became actively involved in a physical education program for special needs kids run through the Ankeny public school system. It was through that program that she developed a friendship with her buddy Jason. Unlike many of the other kids in the program, Jason could not participate in the larger group activities. He has a mental disability that makes it hard for him to express himself, making him prone to aggressive behaviors. Many days he had his own room with his own personal buddy: Asgton. “Jason was a very, very big part of my life, and I’m fortunate to have known him,” Asgton reflected on her experience. Over the years, she developed a unique relationship with Jason’s parents, which allowed her to visit Jason at his home a few times a week to continue to encourage and support him. In addition to her community service, Asgton found time in her busy schedule to cultivate a passion for dance. From the moment she took her first steps, Asgton was dancing. 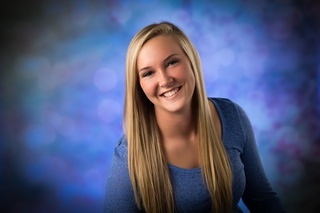 Her move to Iowa allowed her the opportunity to join a studio and dance competitively, and she was also a member of Ankeny’s varsity cheerleading team. Her dance career was interrupted during her freshman year—which taught her firsthand what it is like to be unable to do normal day-to-day tasks. Shortly after starting high school, Asgton had to undergo two hip surgeries to fix torn tendons and ligaments. During the recovery process, she had to rely on other people to carry her backpack and help her move around the school. It was a humbling experience for the active student, who got a small taste of what Jason and many kids like him may have felt day in and day out. Asgton’s volunteer work and academic dedication made her one of many outstanding students who have received scholarship awards through Ankeny Dollars for Scholars. The affiliate will cross a major milestone in the spring of 2017 by officially awarding one million dollars to students over their 34-year history. They are proud to partner with a supportive community of individuals and businesses to support the outstanding students of the Ankeny school districts. Service continues to be the theme of Asgton’s life, as her experience has played an instrumental role in forming her future career plans. The future neuroscience major aims to attend medical school after earning her undergraduate degree. “I want to help people. I want to give back,” Asgton said about her career goals to become an orthopedic surgeon. Once again the transitory military lifestyle has left its mark on Asgton’s life as she and her family move from Iowa to California. Asgton is now attending San Diego Community College and hopes to transfer to the University of California next year to continue her education and expand her leadership impact. We congratulate her on her 2016 Student Volunteer of the Year Award!